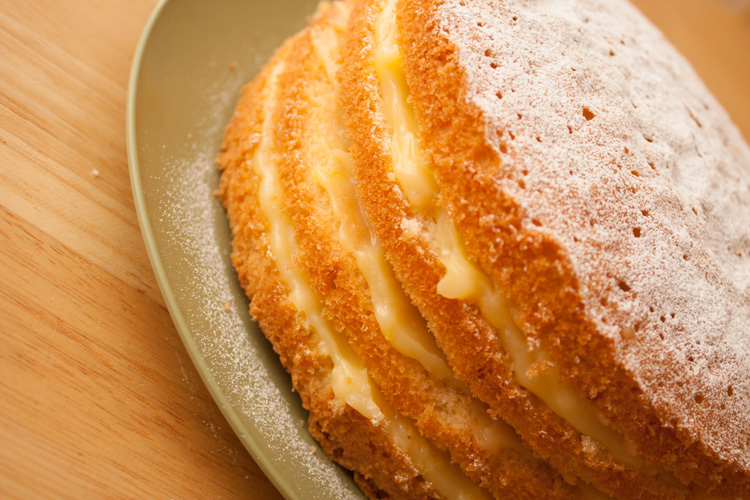 This is a Delia Smith recipe, it is a basic Victoria Sponge with a bit of lemon added, and sandwiched together with fresh home-made lemon curd. 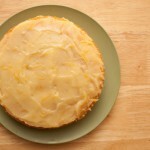 This makes for a delicious light and lemony cake. Pre-heat the oven to 170°C (325°F or Gas mark 3, 150°C for a fan oven). 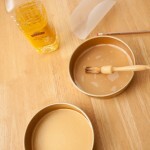 Grease and line two 16 cm (6½ inch) cake tins, greasing the lining as well as the tins. 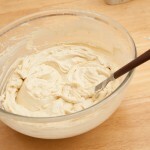 Blend all the cake ingredients together in a large bowl using an electric hand whisk. 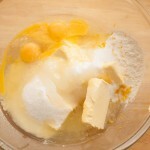 Whisk until the mixture has a nice smooth creamy consistency. You may want to leave out the lemon zest and stir it in after whisking, as otherwise the pieces of zest tend to get stuck round the whisk blades. Divide the mixture evenly between the two tins, spreading the mixture to the sides of the tins. Cook in the oven for 35 minutes. When cooked test the cake with a skewer to make sure the skewer comes out clean and not sticky. If sticky, cook for a little longer. Cool the cakes in the tins for about a minute. Then turn out, remove the lining, and cool on a wire rack. When the cakes are completely cooled (will normally take at least a couple of hours), carefully cut each one into two horizontal layers. Add all the ingredients to a reasonably large heat-proof bowl. The bowl needs to be big enough to comfortably rest on top of a saucepan. 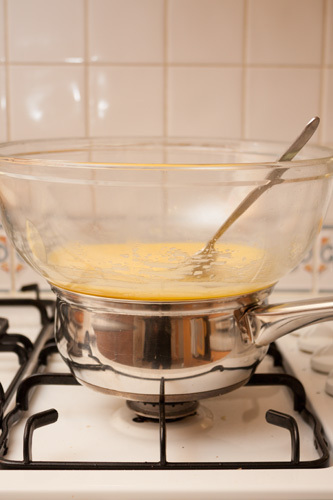 Add some boiling water to a saucepan, make sure the level of the water is low enough to give a few centimeters between the water and the bottom of the bowl. Put the saucepan on the hob, and get it to a temperature where the water is just about simmering. On my cooker, this meant having the (gas) hob at its lowest setting. Now place the bowl of ingredients on top of the saucepan, and stir well. Keep stirring, almost constantly, until the mixture has thickened. This will take about 20 minutes. 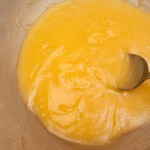 If after 20 minutes the mixture has thickened, but doesn't seem as thick as real lemon curd, this is normal. It will thicken further when it cools down. 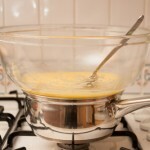 When thickened, take the bowl off the saucepan and leave the lemon curd mixture to cool for about half an hour to an hour. 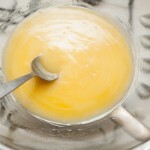 When making the lemon curd it is important that the mixture does not get too hot. 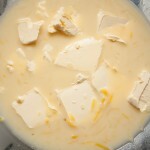 If this happens, or you leave the mixture for too long without stirring it, you'll find that white bits (like meringue) start to form. If this does happen, so long as you don't get any really big bits, you can salvage the lemon curd somewhat by whisking it after it has cooled to break up the white bits. 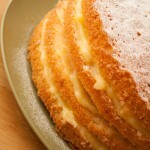 Use the home-made lemon curd to sandwich the four layers of the cake together. 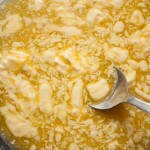 You should have enough lemon curd to spread it quite thickly. To finish the cake, dust the top lightly with some icing sugar. 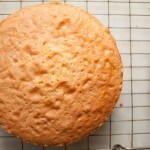 As with almost all cake, you should store it in an airtight tin. 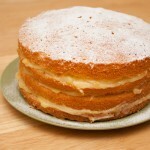 I actually find this cake tastes nicer after a day or so, as the lemon curd filling starts to soak into the sponge. Thanks for the easy and wonderful recipe .Love you!! I think there must be something not quite right with the recipe because the sponge did not rise enough to slice each cake into two…. 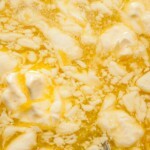 I’m wondering if it required only the egg whites, not the whole eggs? Hayley, I just had the same issue and realise that my cake tins are 8″ rather than 6″ – maybe you did the same! 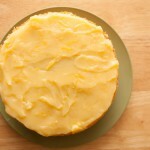 finish up with a 1 layer cake & lots of delicious lemon curd!